History : 06/07/99 : Acquired for free. 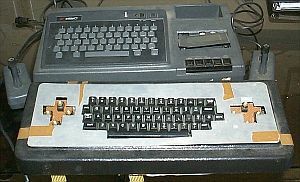 The owner of this system has hacked it to work with a reqular external keyboard in place of the internal chicklet keyboard. There is a switch to select which keyboard you want to work with. I don't have any doc or software so if you can help out, email me.